My eyes zeroed in on Strawberry Pretzel Bars the second I spied it. I love bakery scents and just smelling the wax had me intrigued. Here’s what I’m hoping for… a salty pretzel bakery as the base with lots of creamy vanilla then topped with a sweet strawberry glaze. That’s kind of what the picture implies. Let’s see if I’m close. 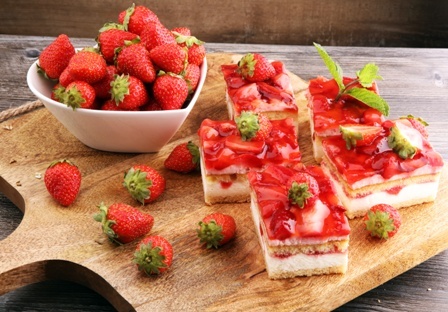 Features fresh sliced summer strawberries stirred with cane sugar and sweet vanilla-infused whipped cream atop a rich butter and salted pretzel crust. Oh yum!! My dream idea of what I wanted was a little off but still close enough. Crossing fingers everything in that scent description comes to life. I used the entire clamshell pack (3 cubes each) in two electric melters in my great room. It’s a huge room and that’s what works best for me. Once melting, it took minutes before the aroma was traveling through the room and, oh yum!! Major strawberry yum!! Strawberry is not an easy scent to get right in wax but this one smelled pretty darn amazing. Up close to the melters, I could totally smell the salty pretzel blended with sweet strawberry cream. Away from the melters and just sniffing the air, the air smelled like a warm strawberry with hints of bakery notes. The salty pretzel dulls out a bit leaving behind a smooth and creamy strawberry bakery. I LOVED this scent!! 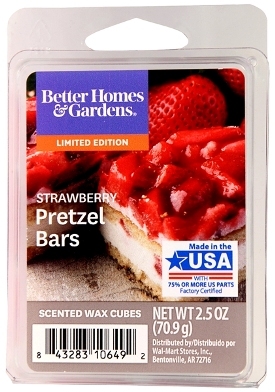 Strawberry Pretzel Bars smelled pretty darn good and a scent I totally recommend if you’re a fan of bakery scents. I’m going back for more. Lots more! Strength – I would rate Strawberry Pretzel Bars a 10 out of 10 in any size room. Loved the full bodied strength of this one. You can’t miss it the moment you’re even near the room you have it melting in. Go purchase this scent bakery lovers and hurry… it’s a limited addition scent so it won’t be around for long. I just bought this and now I’m really intrigued, I’m off to melt this right now!